Supply drilling fluids system and submersible slurry pump Supply double deck adjustable shale shakers? We are desilter and desander China manufacturer,we sell desilter and desander worldwidely. Learn more: Desilter and desander. As a solids control equipment of the third stage in drilling operation, desilter is used to remove solid particles of 20-40µm. Through constant practice and innovation, this disilter has been featured by reliable technical properties, good processing results, long service life of its hydraulic cyclone and stable performance. Desilter and desander is suitable for any kind of drilling rigs. The hydraulic cyclone adopts fast makeup in its inlet and outlet, which is convenient for replacement and maintenance. 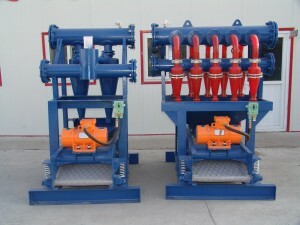 China directional drilling mud system desander desilter manufacturer, Offer and sell the best desander desilter to customer. All I can say is keep it up. Some professional bloggers post three to four times a day on their blogs, simply because this constant addition of new content helps those to get regular readers.